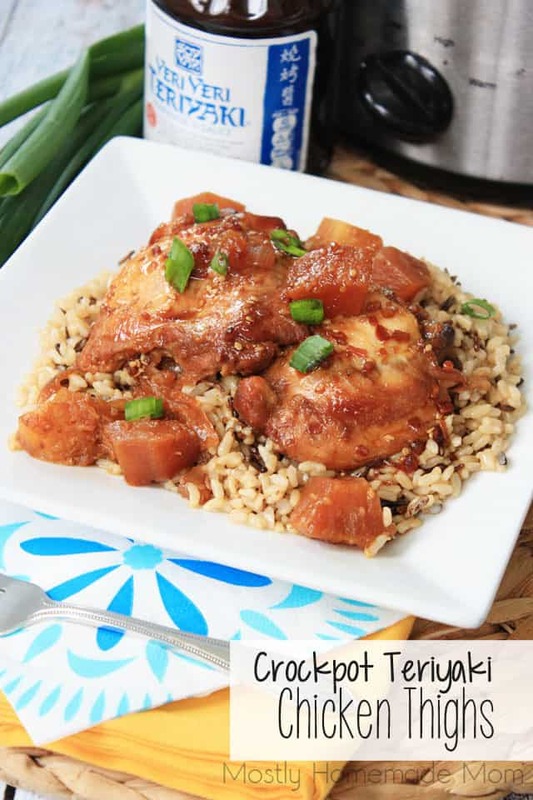 This Crockpot Teriyaki Chicken recipe SO easy on a busy weeknight! 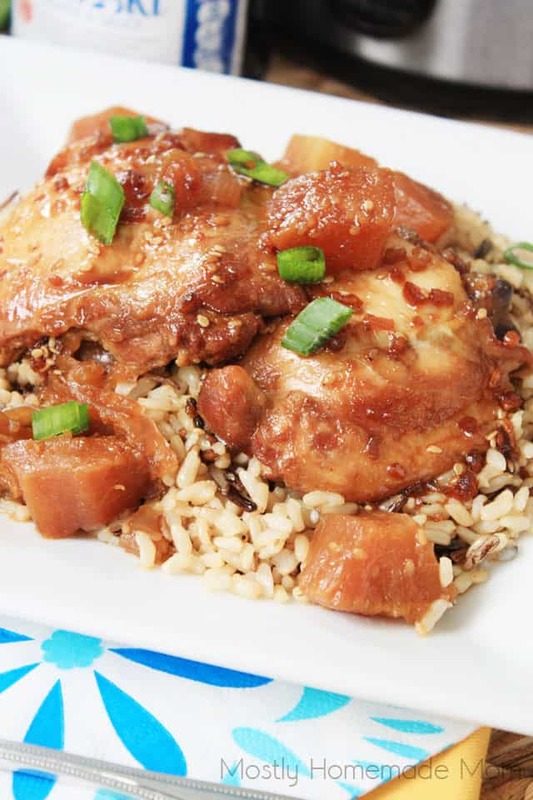 Chicken thighs with sliced onion, pineapple, and teriyaki sauce over brown rice – just like takeout, at home! Ahh… teriyaki chicken. I have very, very fond memories of mall food court teriyaki chicken when my husband and I were newly married. The aroma and the flavor of that delicious and filling dinner – seems like just yesterday! Three kids later, it’s no wonder why this delish Crockpot Teriyaki Chicken is a favorite around this house. 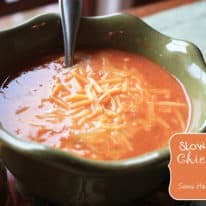 It may seem counter intuitive, but slow cooker dinners are perfect for busy weeknights. Just set it in the morning and forget it until dinner time – easy peasy! Heat olive oil in a deep skillet and cook chicken thighs in batches until browned on both sides, about 4 minutes on each side*. You won’t be cooking the chicken through, just cooking the outside of the chicken enough to hold together while in the Crock pot. Lay sliced onions and pineapple chunks in the bottom of the slow cooker. Place browned chicken on top and pour teriyaki sauce over chicken. Cover and cook on low for 6 hours or on high for 4 hours. Serve over steamed rice. Why brown the chicken thighs first? Browning the chicken keeps the thigh pieces whole while cooking, otherwise the chicken will end up shredded or “pulled” when it’s done. Some people don’t mind or even prefer the shredded texture, so feel free to skip this step if desired. Can the rice cook in the Crock pot with the chicken? It’s not recommended to cook the rice with the chicken due as there is only enough liquid content to flavor and cook the chicken. Just cook up a frozen steamer bag of brown or white rice when the chicken is done cooking in the slow cooker. 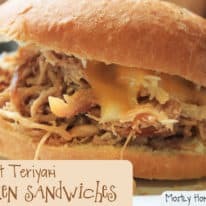 Can you freeze Crock pot teriyaki chicken? You can absolutely freeze leftovers of this delicious dinner! Just place uneaten rice and chicken in individual serving portions in your favorite freezer containers. Thaw in the fridge and reheat in the microwave, or just reheat directly from frozen in the microwave (will take a bit longer this way). 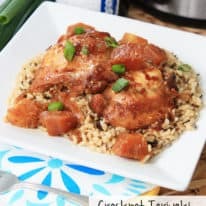 If you liked this Crock Pot Teriyaki Chicken recipe, please leave a rating and a comment below this post! 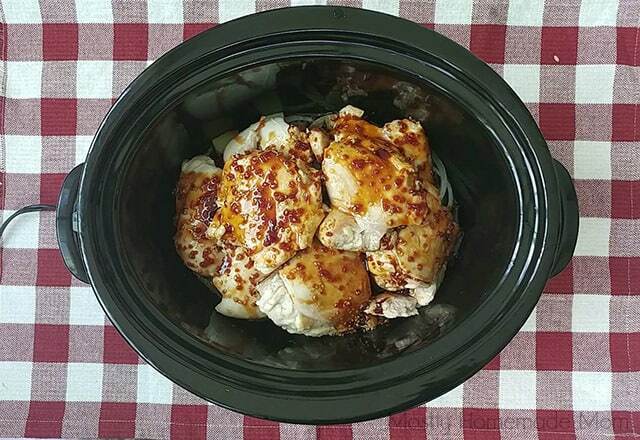 Crock Pot teriyaki chicken recipe with boneless chicken thighs, onion, pineapple, and teriyaki sauce. Heat oil in a large skillet over medium high heat. 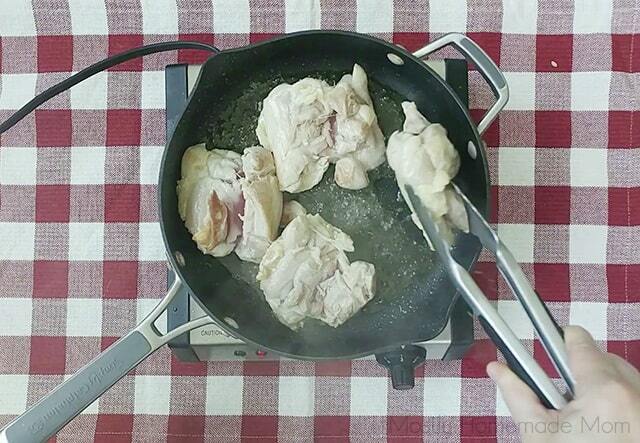 Cook chicken in batches, 4 minutes on each side, to brown. 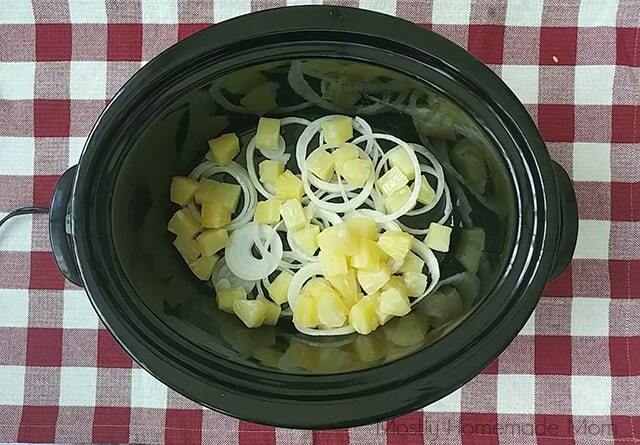 Place onion and pineapple in the bottom of a slow cooker. 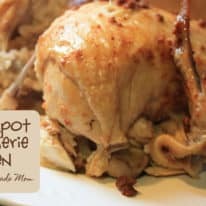 Place browned chicken over onion and pineapple in Crockpot. Pour sauce over chicken. Cook on high for 4 hours or on low 6 - 8 hours. Serve over cooked brown rice and sliced green onion.